Conrads LTM 1200-5.1 was first-time presented in 2007. In the meantime a couple of nice company liveries have been presented. 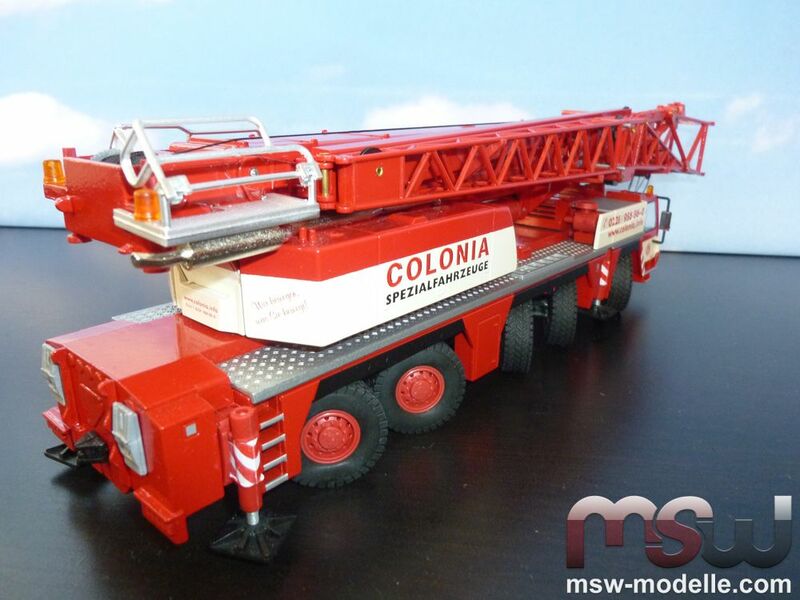 A recent fantastic addition to these is the all-new Colonia version; exclusively made by Conrad for MSW Modelle. 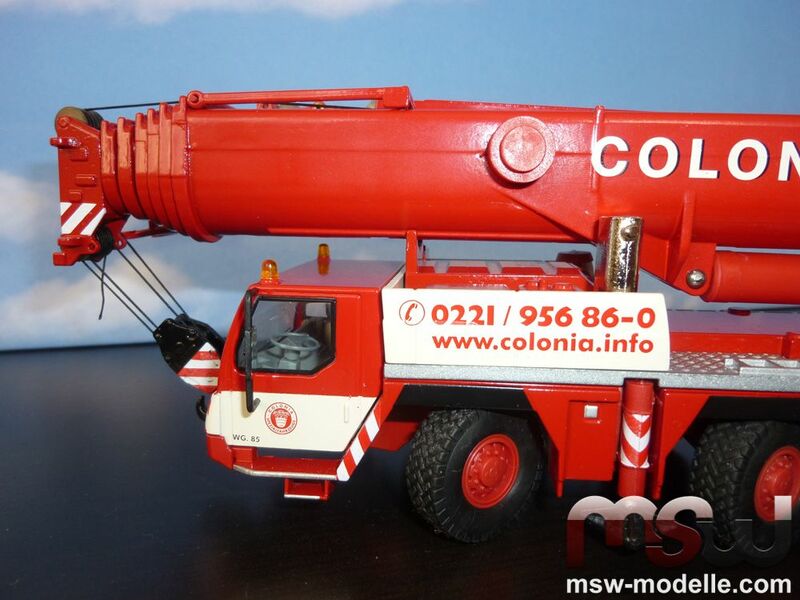 Colonia is based in Cologne and it's typical red with beige shares look really nice. And in addition to the initial version Conrad has given this Colonia version single metal sheaves. 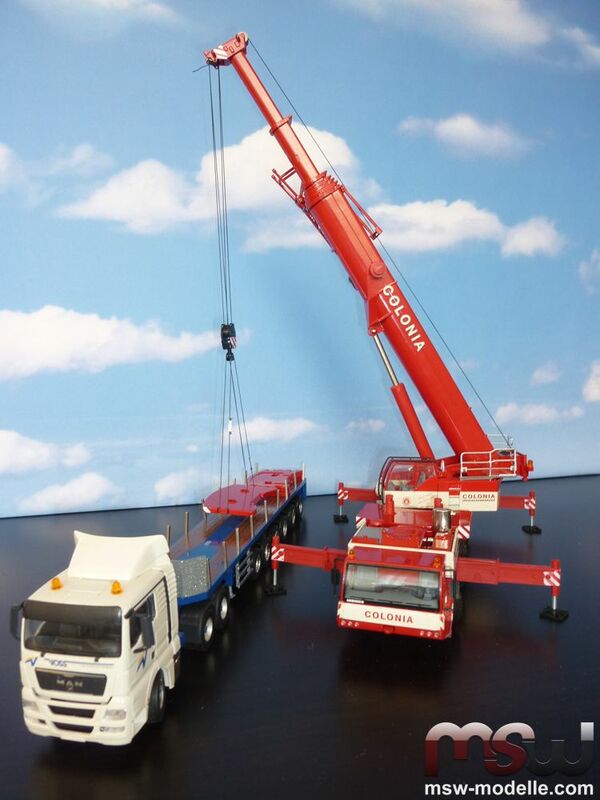 The crane travels easily on five axles. Even with the maximum steering angle an easy moving on the surface is possible. The all needed mobility is achieved by all axles, which can be steered. The four solid outriggers can easily been extended and provide a stable standing while fully configured. Unfortunately all four 2-section outriggers are made of plastic. Two mirrors on each sides of the undercarriage cab provide excellent visibility to the operator in order to safely maneuver the crane. Conrad also copied the interior realistically. Behind the cab the engine compartment is located. 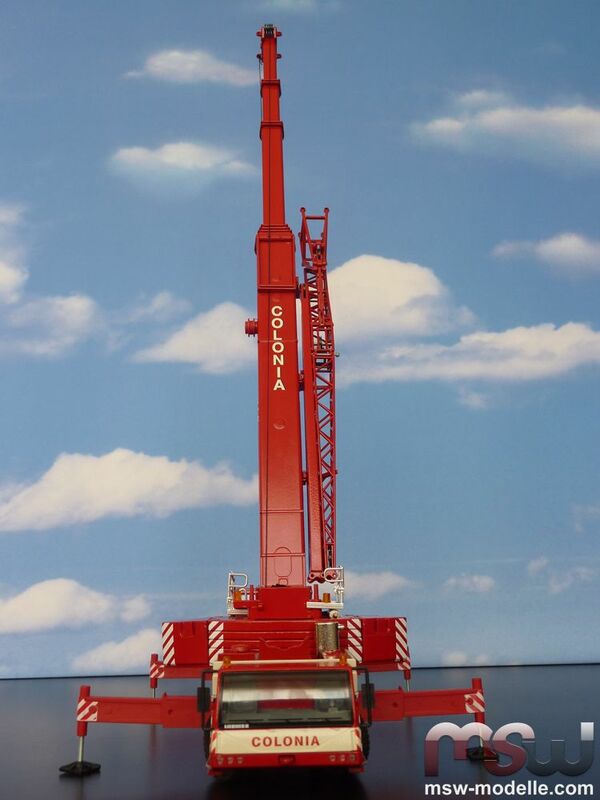 A 503 HP diesel engine would provide enough power while travelling the 60 t heavy crane up to 80 km/h. A special surface on the carrier would protect in reality against falling; this surface is copied by a grid protection made of zinc. This makes the LTM 1200-5.1 really authentic looking. Additional small ladders complete the details. 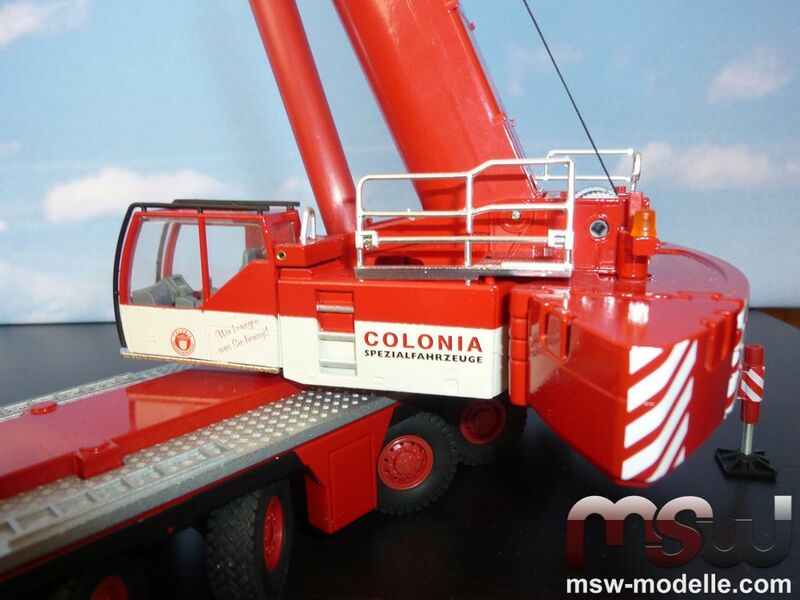 The crane is painted in the typical red with a small beige stripe featuring the Cologne based “Colonia” colors. 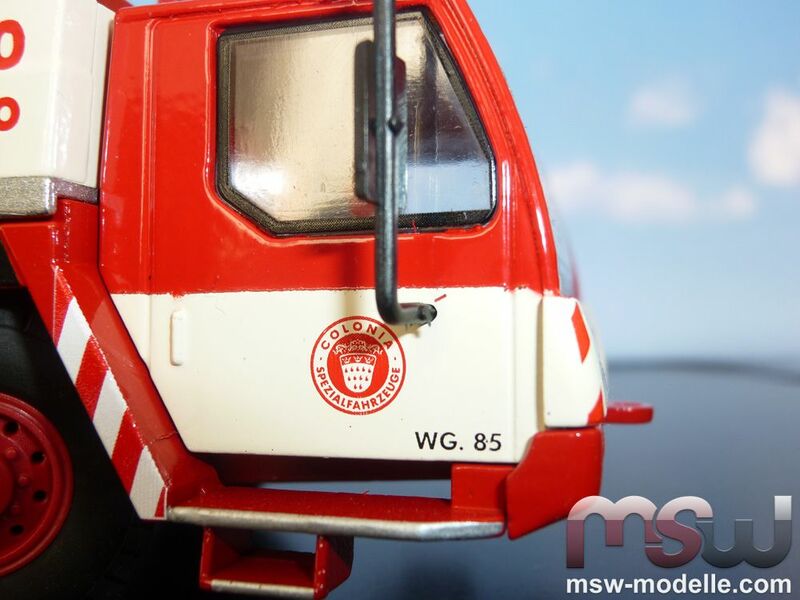 Also available is the vehicle number „WG 85“ on the superstructure’s cab. Colonia’s website and phone number can be found at both carrier sides. 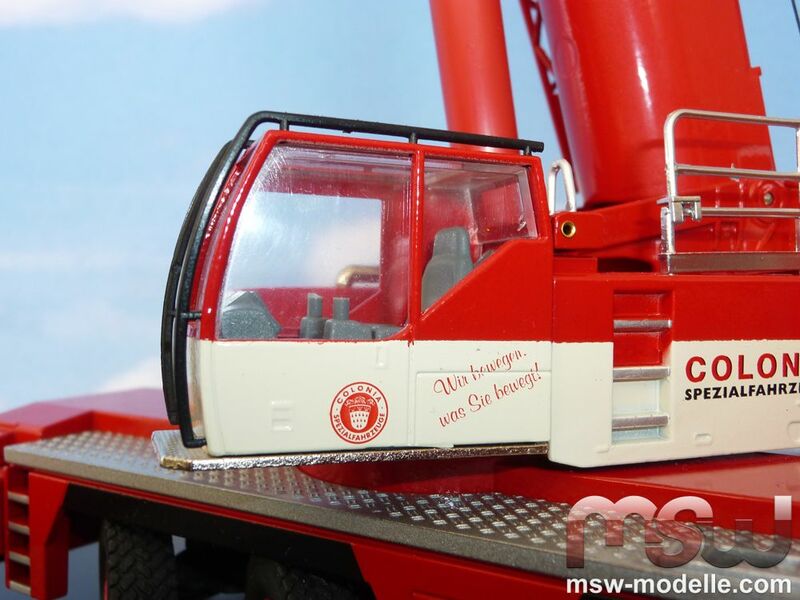 The superstructure cab is also copied realistically with an authentic interior and railings. On the superstructure cab you can read their claim „Wir bewegen was Sie bewegt“. A new type of model counterweight was introduced with the LTM 1200-5.1 ultimately since the counterweight is made of 7 single pieces and not made of a chunky single piece of zinc. The maximum weight can be 72 t in reality. Another great details are the small lifting eyes of each counterweight section. 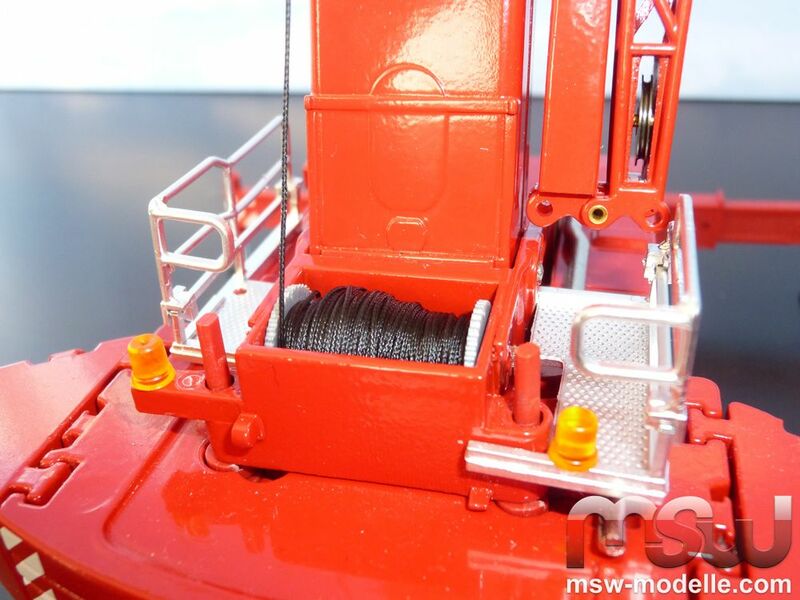 If you use some line from your spare parts box with wire ends you simple can create lines in order to display the model while lifting its counterweight. 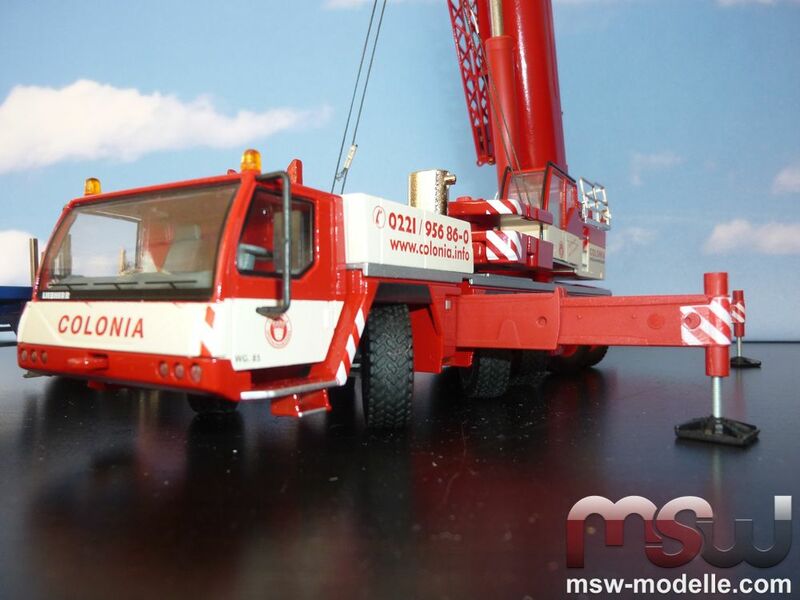 Different counterweight versions can be displayed. The base plate contains the connection points to the superstructure frame. Two small plastic screws are assembled from the bottom to carry the counterweight. This base plate would weigh 12 t in reality, added by further 5 sections. All in all, the 22 t, 32 t, 42, 52 t and complete 72 t versions are possible to assemble. The full 72 t version requires the two side elements. Small railings are located on both sides of the hoist winch; in reality they would provide safety by protecting against falling. 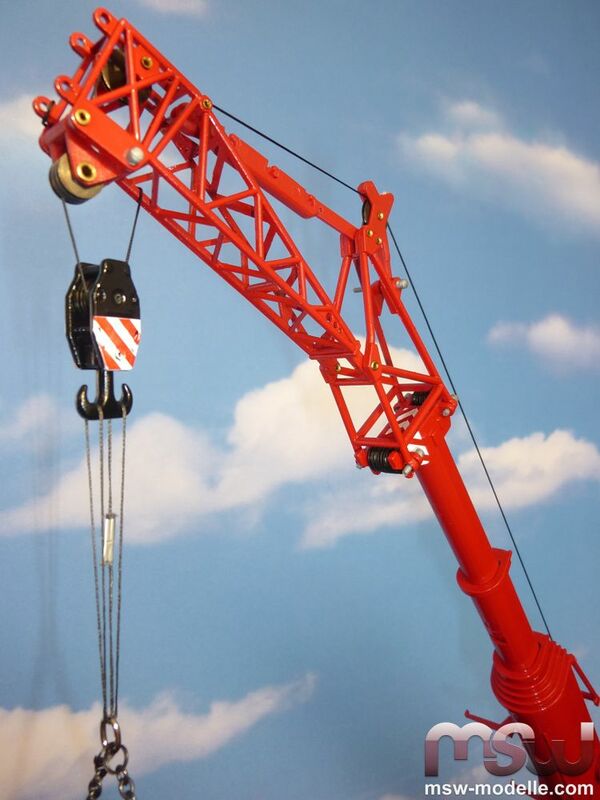 Both can be folded downwards in order to reduce the crane’s height. Additional warning lamps also exist. The superstructure has a very compact layout, the engine cooler can be easily recognized. A 197 HP strong Liebherr diesel engine would provide enough power. The main boom features 6 boom sections with a maximum length of 1,44 cm or 72 m in reality. A rope guidance is located on the main boom section also. 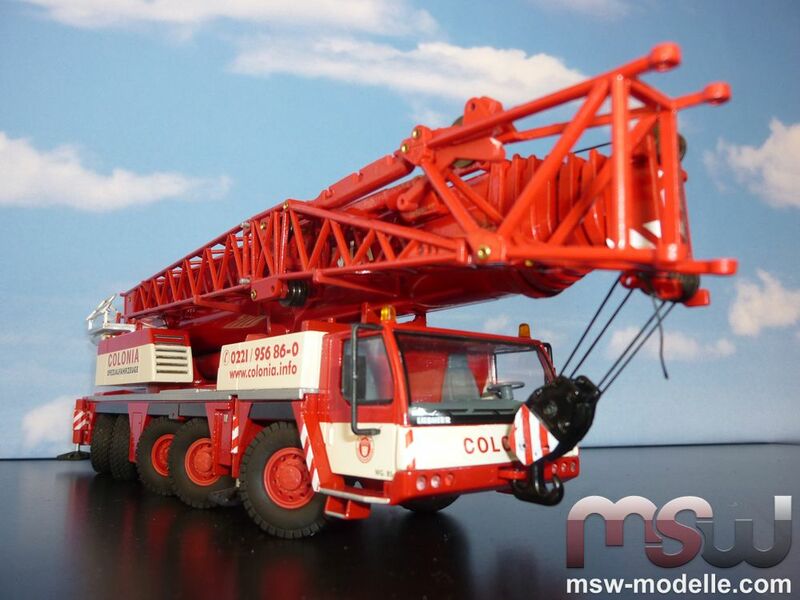 Conrad also redesigned the main hook completely compared to the older LTM 1160 crane model. The new one features three metal sheaves and can be reeved with 2, 3 or 6 lines. The maximum capacity of this hook block in reality is 71 t.
Compared to the very first version of the crane, the LTM1200-5.1 comes equipped now with metal sheaves. 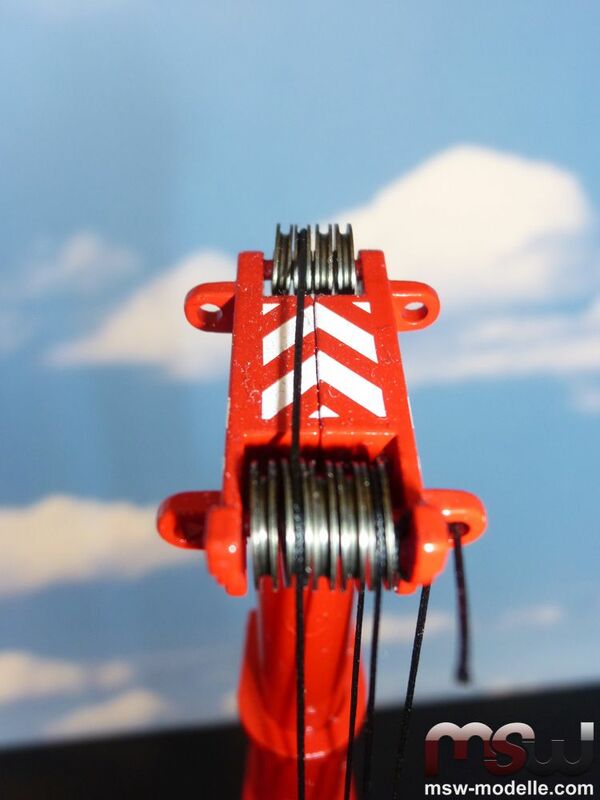 All sheaves move smoothly enabling a hook with four lines to lower without a load. 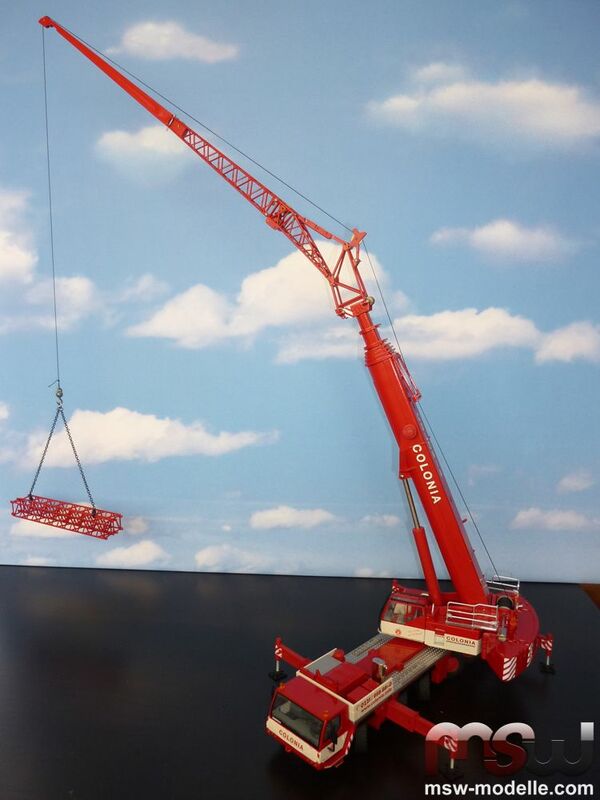 A 4-piece boom extension completes this great crane model. The maximum length would be 72 cm and 36 m in reality. 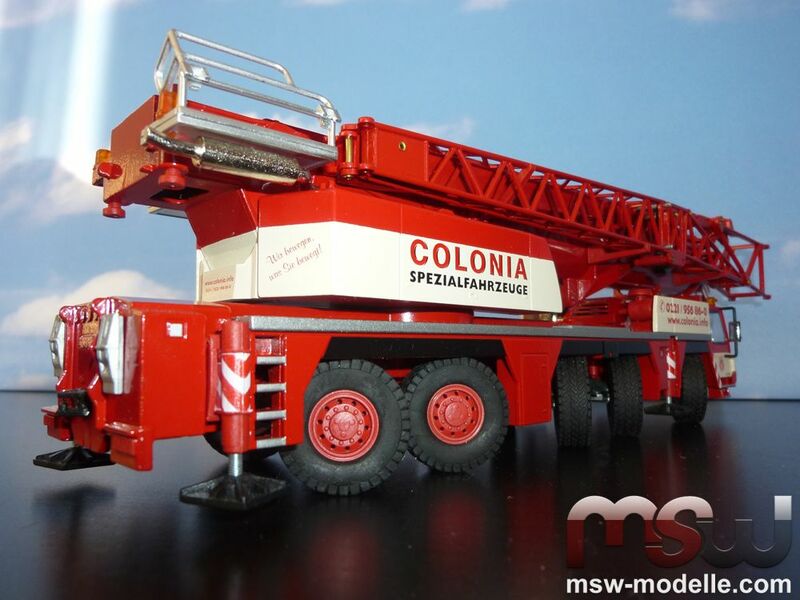 Therefore the maximum boom length can be incredible 216 cm or 108 m in reality. 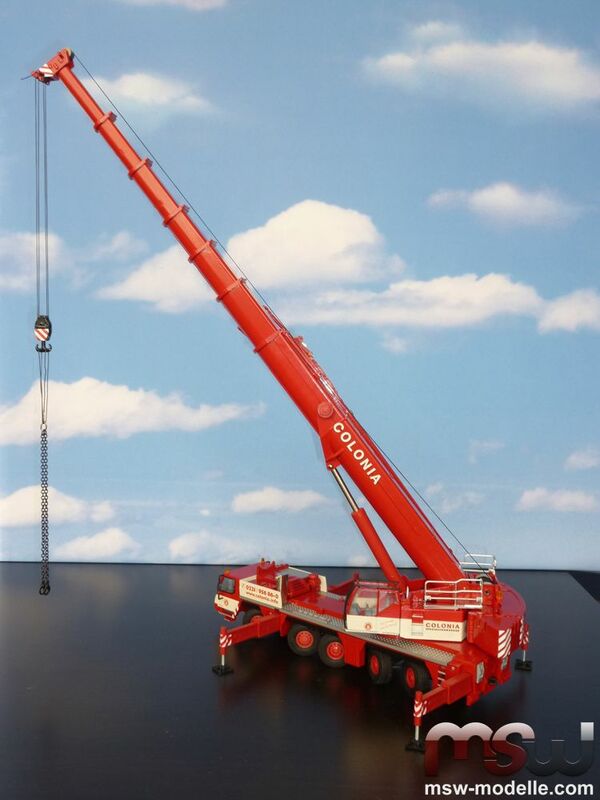 Conrad created a great flexibility – as with the real crane - on the additional boom extension. The minimum version is simply the erection jib with only the extension boom foot. Metal sheaves can be folded when displayed with this jib or placed within the boom foot. 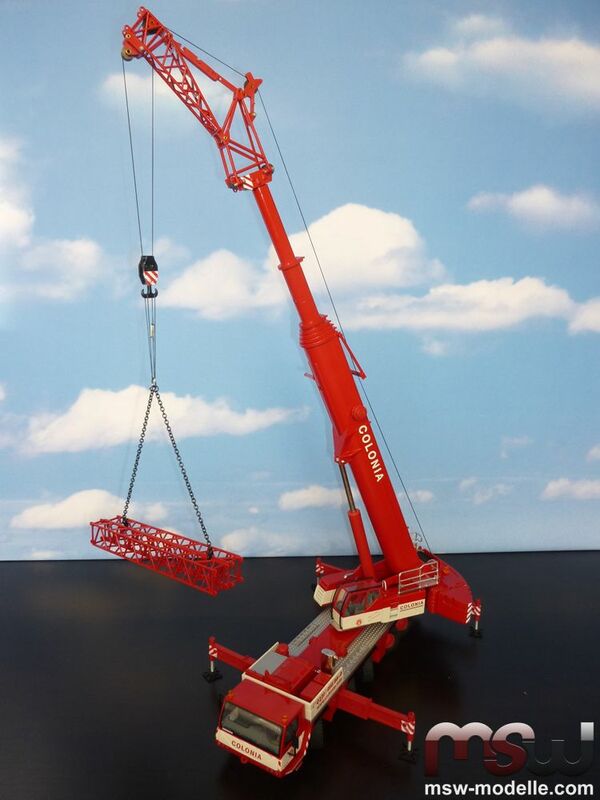 Two further sections can be assembled to the erection jib by using small plastic pins, followed by the boom head. While travelling the boom extension is stored aside of the main boom. Three storage points fix it safely. 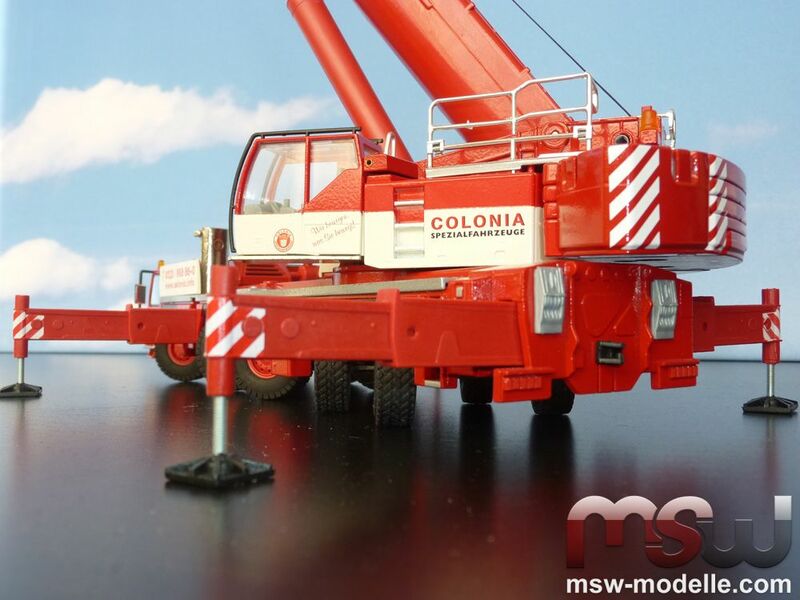 The additional 2 boom sections need to be transported separately.